Okay, I know Raclette grills have been about for ages, and I've always wanted one, but since our house is already overrun with more kitchen gadgets than you can shake a stick at, I've controlled myself from buying one.....till last week that is. Oh my goodness they are such fun and I say everyone should rush out and get a Raclette Grill immediately! Relaxed and sociable eating along with drinking, a raclette meal can still be going on hours later. What can be nicer than cooking your own meal at the table, picking and choosing for yourself just what you fancy? Read on for printer friendly recipe card. Whoa, I've just noticed that cheese is missing from the table, I must have brought it out after the pictures - and in case you're wondering about drink....yes the wine hadn't got to the table at this point either! The only slight problem I need to overcome is there isn't enough room at the table for anymore people once it's filled with the grill and all the food. The name 'Raclette' refers to a meal and also to a type of cheese with the same name. Which as yet I've not been able to find here in the UK, that said I haven't looked hard enough as I've discovered you can get it here. 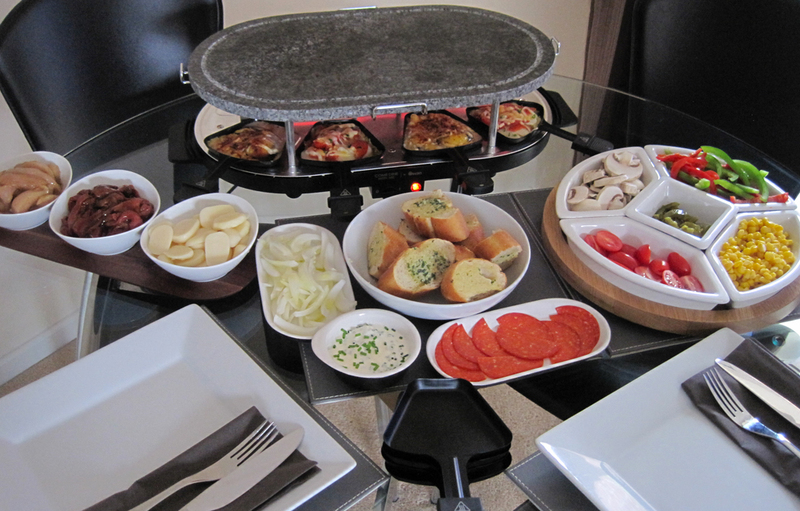 Traditionally raclette is a dish is of melted cheese and boiled potatoes, served with small gherkins and pickled onions along with dried meats, ham and sausages etc. These days we can now buy one as an electrical appliance called Raclette grills, which are table top machines. They come with either a stone top or a metal griddle and or pancake griddle. 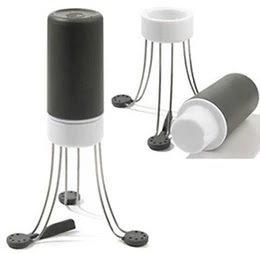 Raclette grills also come with individual melting pans (called coupelles) that sit underneath the top and are used to melt cheese or heat already cooked foods such as boiled potatoes. Sliced mushrooms, sliced red and green bell peppers, jalapeno peppers, sweetcorn, baby tomatoes. Sliced new potatoes (feeling lazy myself I used the ones in a tin). Thinly sliced strips of beef marinated in Jack Daniel's Hot Pepper Steak Sauce, thinly sliced chicken fillet marinated in Old El Paso Original Smoky BBQ spicy mix for fajitas. Pepperoni, soured cream and chives (only because I had some living on the fridge which needed to be used up) and sliced onion. The Raclette grill came with 8 melting pans and since there were only two of us at this 'Raclette party for two' I made a couple of dishes ready to take out to the table and for these pictures....coz once I've started eating and drinking, pictures just ain't gonna happen! Above is a concoction of egg (just crack into the melting pan) top with a slice of Monterey Jack cheese and sprinkle with a little paprika for a bit of colour. Verdict, very moreish and truly delicious. And my next concoction, a pizza style fiery mixture of cheesy goodness! 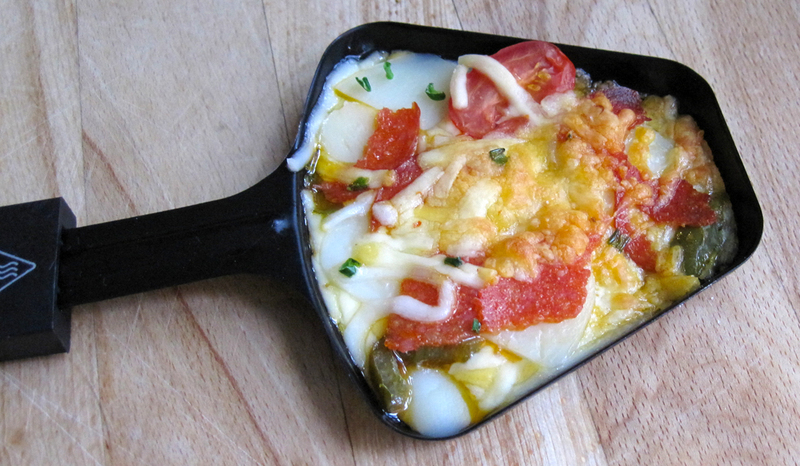 Into the melting pan, slices of cooked new potatoes, topped with a mix of grated cheeses fiery from the added crushed chillies (available in any good supermarket) add to that slices of pepperoni halved baby tomatoes a a couple of jalapeno peppers taken from a jar. A few snipped chives, why? because I had some left from making the soured cream earlier. All that's left to do is pop the pan underneath the raclette to bubble and melt then enjoy. 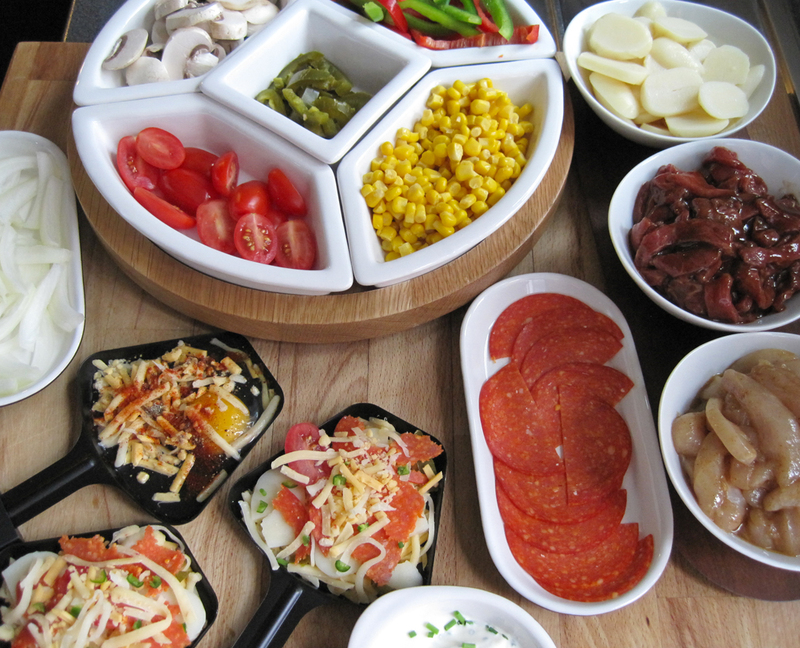 Just a few ideas for Raclette! You can have whatever takes your fancy but cheese is a must. Crumble up your nachos, top with salsa and a little grated cheese then top with jalapeño peppers. Once they've melted under the raclette you can top with sour cream. Cook on a raclette - meat/poultry on the top and other bits and bobs in the melting pans. 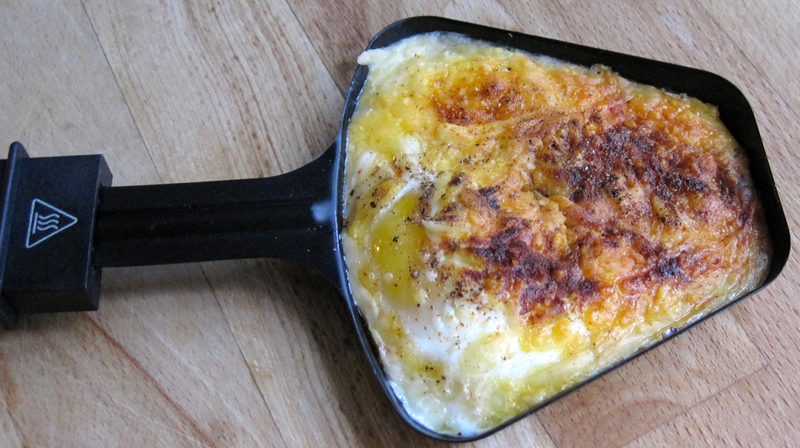 Check out some more of my Raclette recipes. 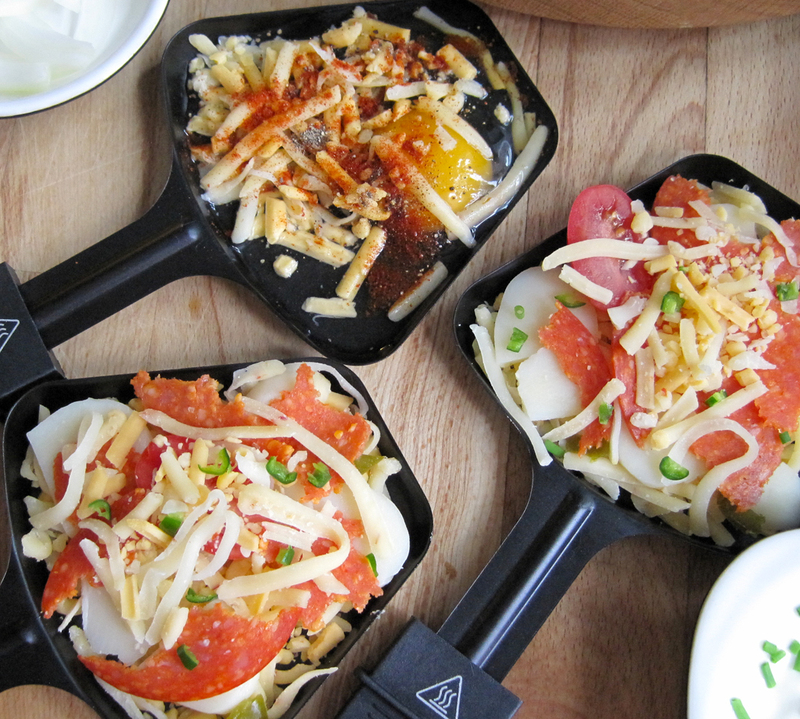 I hope this post has made you want a raclette grill. Oh my word!! I now want it, my friend in France was telling me about these and now seeing it,my interest has possibly quadrupled! Raclette can be bought here I have seen it at markets but Waitrose online sell it. My daughter bought me one for Christmas 2 years ago and still haven't used it! Want really sure what to cook on it? Yes we do have the cheeses in every supermarket here in France but thought the pan was just to melt the cheese in? And didn't fancy poring melted cheese over beef or chicken! As the French do. .so armed with that's recipes I will get it out of the store cupboard and give them a go..
We also got one from Lidl for 17.99, works a treat! We buy the cheese at lidl and freeze it as it isn't on sale very often and flies off the shelf! We buy it from lidl and freeze it as they don't sell it regularly.